Parks can be designed in several different ways. We identify a continuum of five strategies: manicured, organized, State Park style, wild, and neglected. State Park style is distinctive in that it typically combines two different kinds of landscape design. One part typically has canopy or sub canopy trees with a ground plane of mowed grass; the rest of the park will be wild. 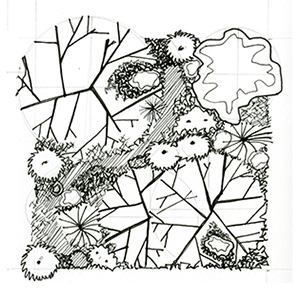 Each of the landscape design strategies is depicted below. The kit of parts from which each of the design strategies in created is a canopy or sub canopy tree; two sub canopy or understory trees (each a different species), some shrub level plants, and a ground plane. On the ground plane are either several different kinds of plants, or mowed lawn grass. Several of the landscape design strategies also include a path.